Imagine four decades of earning a living from what you love passionately and how even more fulfilling it would be if it also involves putting smiles on the faces of many. It is almost unthinkable that Craig Ferguson has been doing one job in entertainment for almost forty years now. Even more confounding is the fact that he is still waxing stronger and stronger by the day. Let’s look into the life and career of this multiple-award-winning comedian, actor, author and television personality, Craig Ferguson. We shall be considering the regulars about him such as his early life, parental background, training, career and family life. Craig was born a Scottish on May 17, 1962, in Springburn Glasgow, Scotland to father Robert Ferguson and mother Janet. While he was still very little, his family moved from Springburn to nearby Cumbernauld, also in Glasgow. This is where he spent a good part of his growing up days. For his elementary education, Craig went to Muirfield Primary School in Cumbernauld, proceeded to Cumbernauld High School after which he took up an apprenticeship to be an electronics technician at a local factory belonging to the American electronics giant Burroughs Corporation. It seems that this contact Craig had with America via Burroughs Corporation would go a long way in ‘Americanizing’ him even though it was not Craig’s first contact with the American civilization. The entertainer had once visited a relative briefly in New York City in 1975. He was only thirteen at the time, but that visit got him inflamed with great love for America. So, after high school at sixteen and having worked at Burroughs for some years, Craig went back to New York at 21 to stay with the relative he had visited when he was younger. He was determined to make something of himself in New York, so he took up work at a construction firm in Harlem, doing odd jobs mainly. Doing odd jobs at construction sites in Harlem, toned and built Craig Ferguson’s muscles making him look more like a weight lifter. His macho stature soon earned him a place as a bouncer in a night club named Save The Robots. The club was an after-hours place that operated quasi-legally from a basement in New York’s East Village. The club was a hub for nightlife seekers and was frequented by a good number of entertainers. Some of these entertainers that were regulars at Save The Robots included the very famous performing musician Dean Johnson, who ruled New York City’s nightlife and showbiz in the 1980s and 1990s and even part of 2000s. Another famous entertainer that was a regular face at the club was the night club DJ, Lady Bunny. Eventually, Craig returned to Scotland where he became a drummer for a Glasgow-based rock band. It can be said that this was the start of Craig Ferguson’s career in the entertainment industry. In fact, by his own testimony, it was the leader of that band, Peter Capaldi, who inspired and encouraged him to go into stand-up art. And with the help of Capaldi, Craig was able to create a character ‘Bing Hitler’ which brought him his first bout of fame when it premiered in the 1986 Edinburgh Festival Fringe. Ultimately, Craig’s love for America drew him again back to the U.S. and the entertainment world capital, Los Angeles through Rick Siegel who noticed his talent at the Edinburgh Festival and who eventually became his agent. Since then, he has grown steadily through the ranks doing what he enjoys and making really cool cash from it. Over the years, Craig Ferguson has established himself as one of the richest talk show hosts. Through some of his very popular shows like The Late Late Show with Craig Ferguson, the most recent Join or Die with Craig Ferguson, his other gigs with netflix as well as his other endeavors as writer of many books, Craig Ferguson is named among the richest living entertainers with a net worth of over $30 million. Craig has been married three times in his life so far. First, he was married to a lady named Anne Hogarth in 1983; he was twenty-one at the time. Maybe because he lacked enough maturity to handle marriage, his union with Anne Hogarth crashed in only three years. In 1998, Craig Ferguson tied the knot again with a lady named Sascha Corwin. This time, he was thirty-six. Perhaps, his increased maturity in age and experience from his first attempt helped him maintain his second marriage for double the duration of the previous one. But his second marriage crashed in 2004. 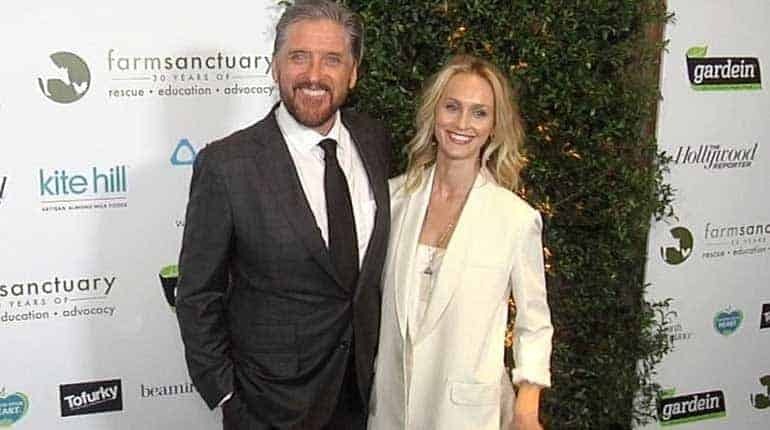 For the third time, while he was 46 in 2008, Craig Ferguson got into his third marriage with a lady named Megan Wallace-Cunningham. After a decade and counting, the marriage still stands. According to available records, Craig Ferguson has two sons and no daughter. His first son Milo Hamish Ferguson was born in 2001 by his second wife Sascha Corwin. Craig’s second son Liam James was born in January 2011 by his third wife Megan Wallace-Cunningham. There has been no indication to substantiate the rumors that Craig is gay especially because he has not come out as one. Instead, the available indication shows that Graig Ferguson’s sexual orientation is heterosexual. Just consider how he keeps moving from one woman to another and you would realize he is clearly oriented towards women.